Enjoy a satisfying meal at The Bay Restaurant serving guests of Trearddur Bay Hotel. Relax with a refreshing drink at one of the 2 bars/lounges. English breakfasts are served on weekdays from 7:00 AM to 9:00 AM and on weekends from 8:00 AM to 10:00 AM for a fee. With a stay at Holyhead Lodge in Holyhead, you'll be within a 15-minute walk of Holyhead Harbour and Ucheldre Centre. 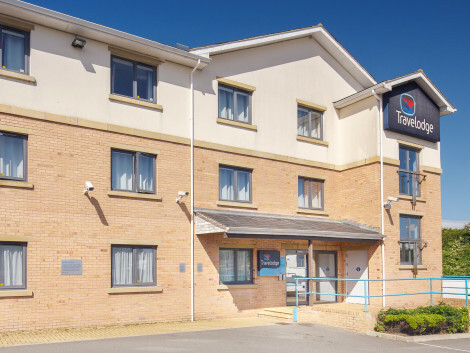 This bed & breakfast is 24.3 mi (39.2 km) from Bangor University and 28.8 mi (46.3 km) from Caernarfon Castle. The largest town in the county of Anglesey, Holyhead is a major port in an attractive setting on the north-western tip of Wales. It sits on Holy Island, connected to the Isle of Anglesey by a causeway. Book one of our Holyhead hotels and explore an appealing town with beautiful beaches and a wealth of maritime history. As well as Newry Beach, at Holyhead itself, there are several other beaches on Holy Island. These include Porth Dafarch, a sheltered beach with rock pools, Trearddur Bay, which has a play area and two golf courses nearby, and Borth Wen and Silver Bay at Rhoscolyn. You can go kayaking, jet-skiing, sailing, surfing, windsurfing, diving, fishing and swimming. Housed in Wales's oldest lifeboat station, Holyhead Maritime Museum tells the story of the town's maritime history. There are models of old ships and lifeboats, information about shipwrecks and lifeboat men, plus an exhibition entitled Holyhead At War, housed in a Second World War air raid shelter. Objects on display include photographs of ships and crew, uniforms and equipment, as well as the teeth and jawbone of a mammoth found in the town in 1864. You can take a tour of the 19th-century South Stack lighthouse, which helps boats crossing the Irish Sea and warns them of the dangerous rock below. Now controlled from Essex, the lighthouse stands on a tiny islet called South Stack Rock, which is separated from Holyhead by 30 metres of sea. Climb the steps down the cliff to the bridge, then climb to the top of the lighthouse and tour the engine room and exhibition area. Thousands of seabirds nest in the cliffs at Holyhead, and there is an RSPB reserve at South Stack where you can see guillemots, razorbills and puffins in their cliffside colony. Look out too for adders, lizards, porpoises and dolphins, as well as the rare silver-studded blue butterfly. The Breakwater Country Park is another good place to spot migrating birds in spring or autumn, as well as a variety of moths, little owls, orchids and grey seals. The Isle of Anglesey Coastal Path, a 125-mile route for walkers – although you can cycle or horse-ride along certain sections – runs through the park. The route follows Anglesey's coastline and starts from St Cybi's Church. Anyone who completes the full 125 miles can receive a badge and certificate. Right on Newry Beach – the sea comes under the restaurant deck at high tide – the Harbourfront Bistro is a family-run TripAdvisor Certificate of Excellence winner serving classic British dishes. For light lunches, scones and generous portions of cake, head to the Wavecrest Café, another Certificate of Excellence winner, where you can also buy local photography. Saffron and the Nuha Tandoori Restaurant are popular places for a curry, or head to Escelantes Mexican for Mexican food. Mandarian Royale, also a Certificate of Excellence winner, serves both Chinese and Thai dishes.